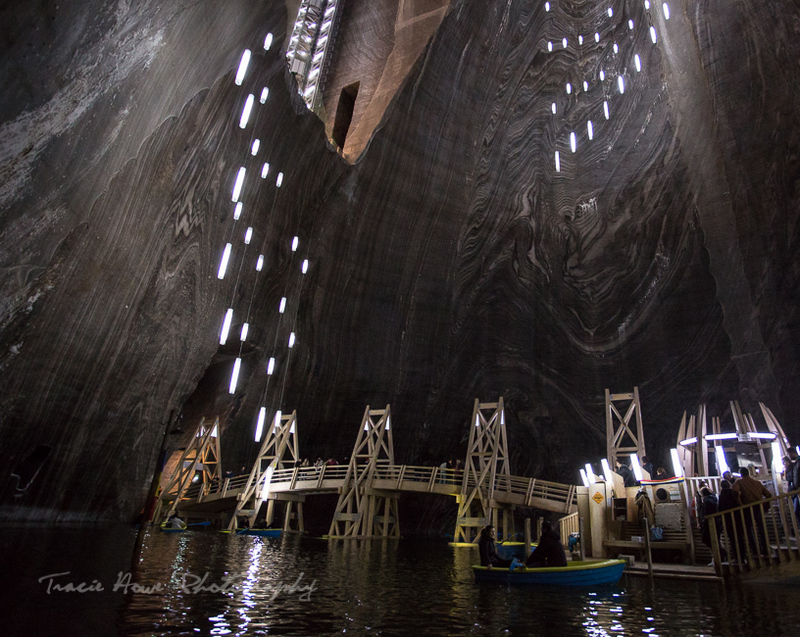 Discover Romania's underground amusement park - Salina Turda Mines | Tracie Travels The misadventures of a restless photographer. Travel photographer and travel blogger, Tracie Howe, wanders the globe seeking out new adventures and photo opportunities to blog about. Join her for a unique perspective on travel, travel photography, and travel tips. 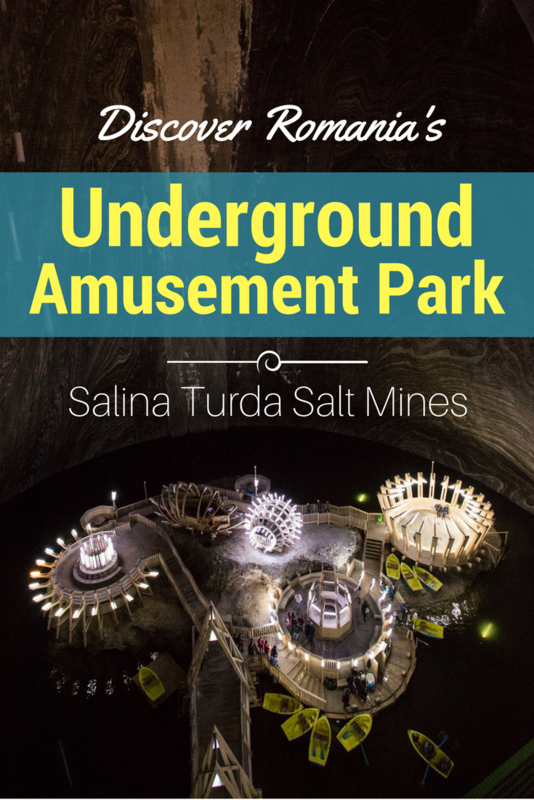 Salina Turda Salt Mines is Romania’s hidden treasure – an underground amusement park not to be missed! 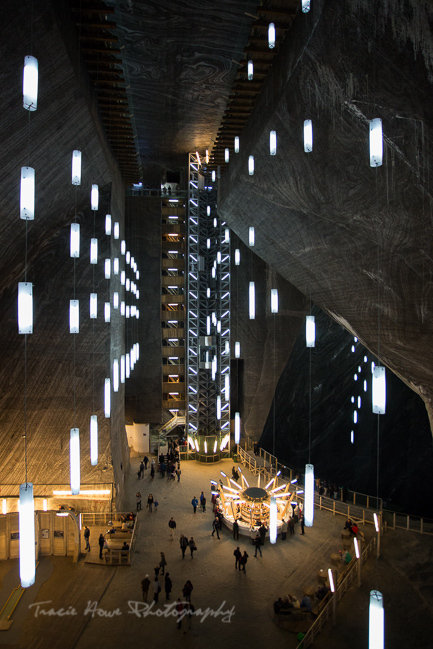 If you’re heading to Romania… frankly, even if you’re not, you’ll want to add Salina Turda mines to your travel bucket list. 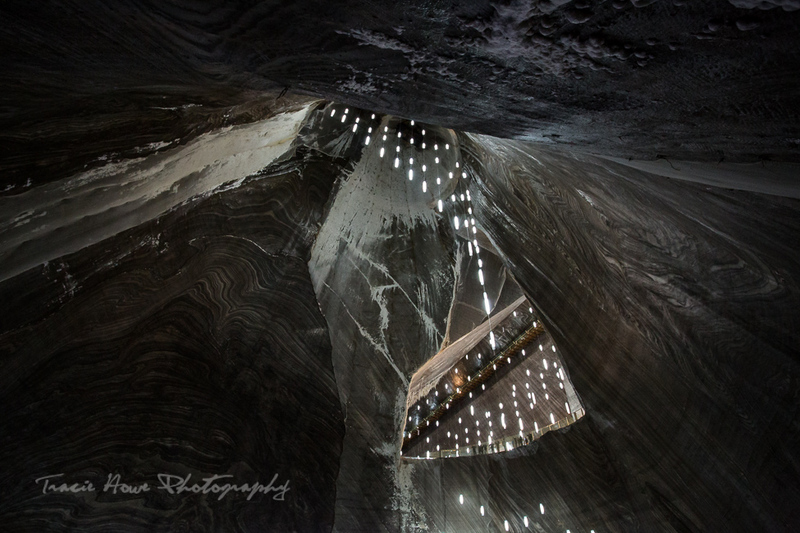 When planning my own Transylvania road trip, I stumbled upon some photos of the Salina Turda salt mines that made me put this destination at the top of my own list! I mean, it’s an underground amusement park, so how could I not go?! 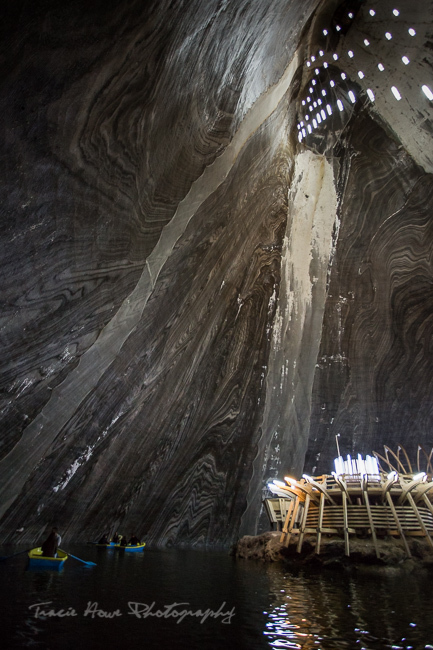 This giant salt mine in the Transylvania region of Romania has records going back to the middle ages. It’s part museum for you history buffs and part amusement park for those of you who like to play… like me! 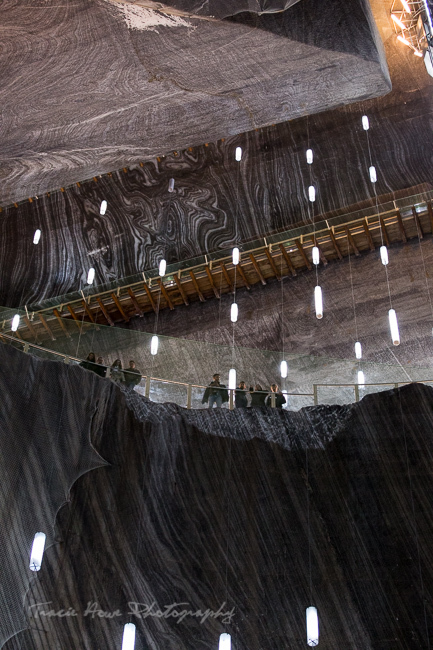 My favorite part was the Terezia Mine, at 120 meters deep. 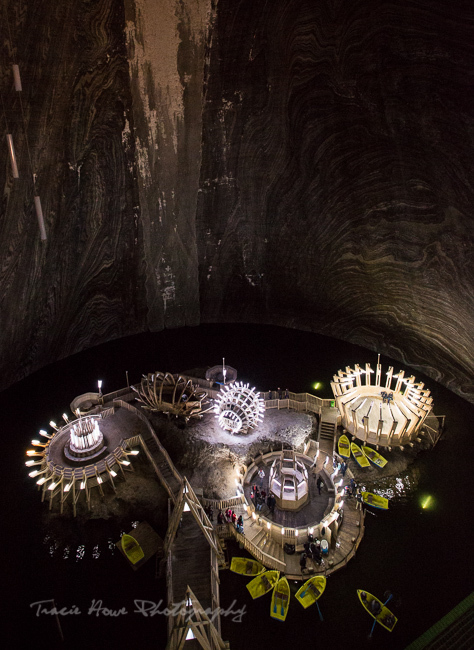 At the bottom, a subterranean lake surrounds a tiny island with abstract structures decorated with lights. 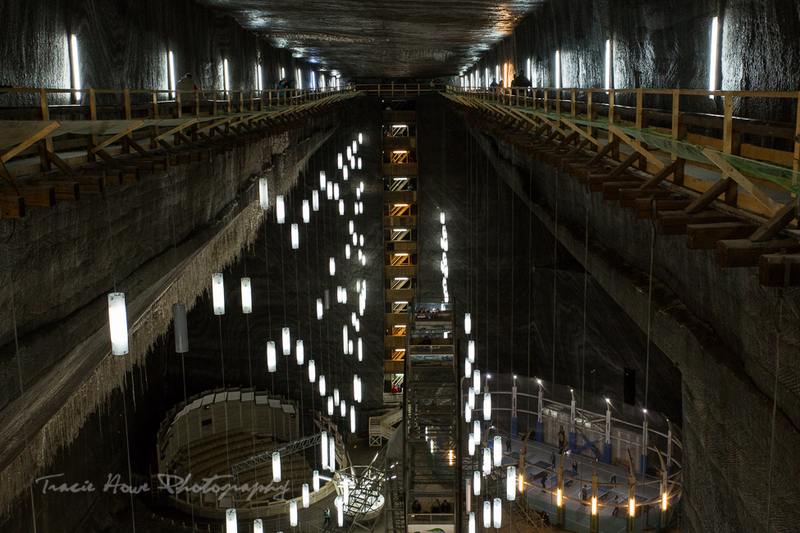 Gazing up from the lake gives you a unique perspective of how truly immense the mine is. 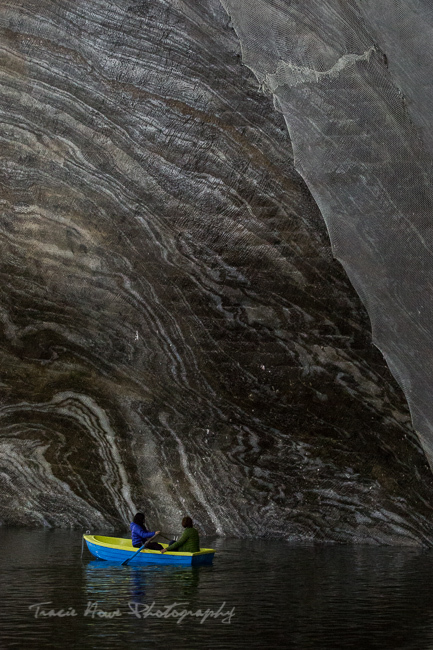 I highly recommend renting a row boat, because it’s the best way to see all sides of this mine. 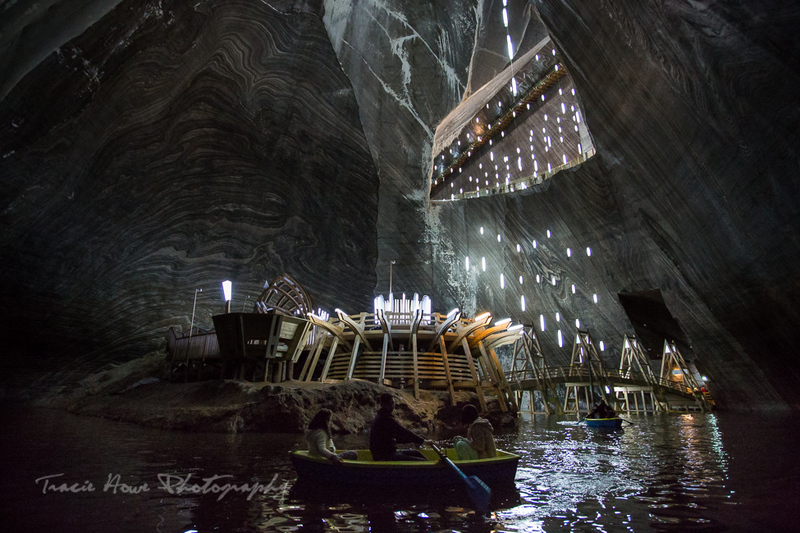 Besides, how often can you say that you’ve been in a boat at the bottom of an ancient salt mine/amusement park? 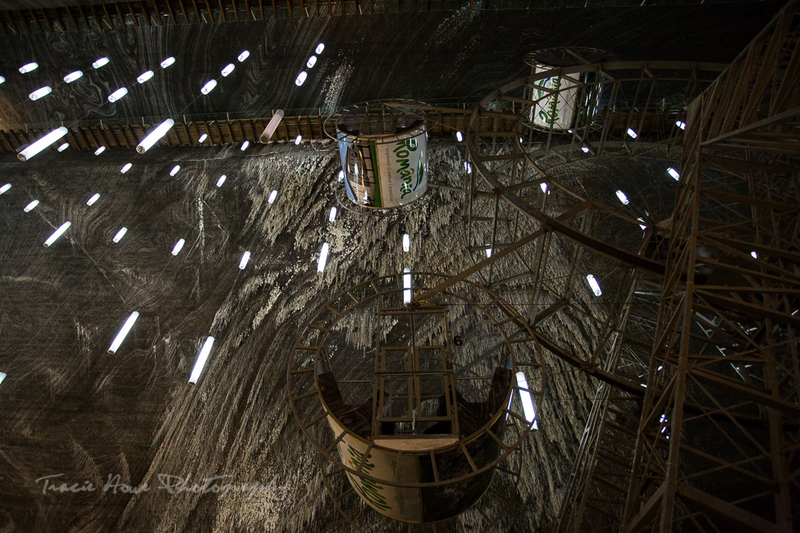 I spent a lot of time in the Terezia Mine, of course, but I also wandered around to other mines which mostly showcased old machinery and historical remnants. 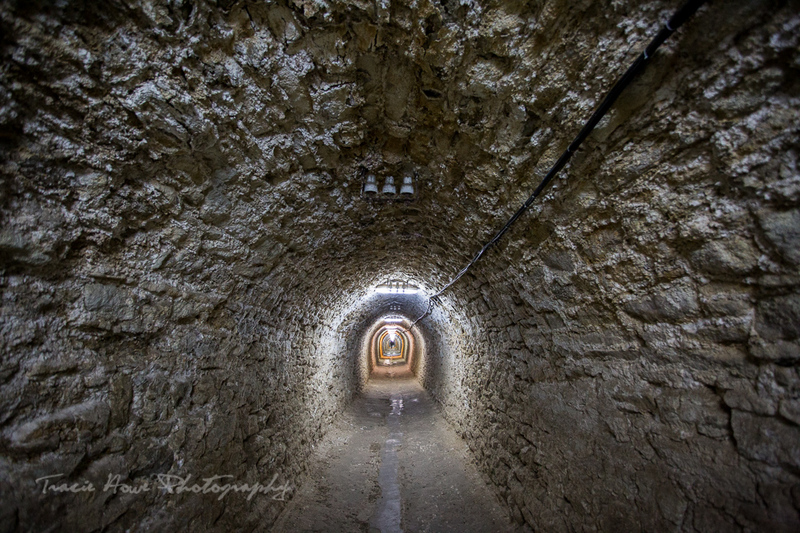 However, the biggest attractions were to be found in the Rudolph Mine. This is the mine offering the most recreational activities, including a ferris wheel, several ping pong tables, a bowling alley, kid’s playground, mini golf course, and more! I had no one with me to play against, so I opted for the ferris wheel, staring longingly at the bowling alley and ping pong tables (my favorite!) as I walked past them. 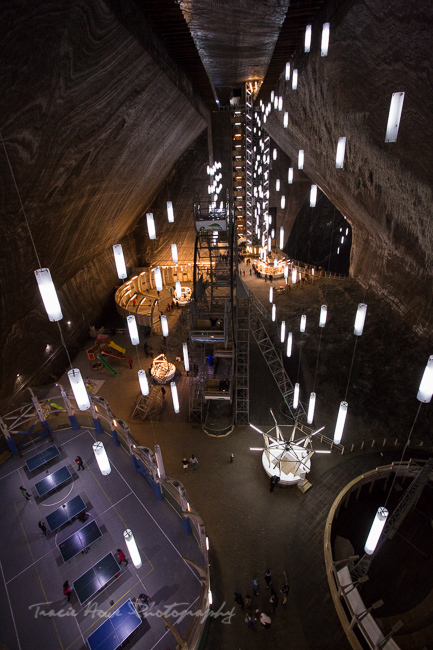 Even though I didn’t have an opponent to play any games against, my visit to Salina Turda salt mines was one of the most unique things I’ve ever experienced! If you’re still not convinced, I have a few more photos here to nudge you to take your own trip. 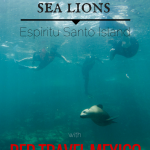 Don’t miss the travel and photography tips at the end! Tripod – Stability will help on the ground when using longer exposures in the dark space. It won’t help much on a boat though! 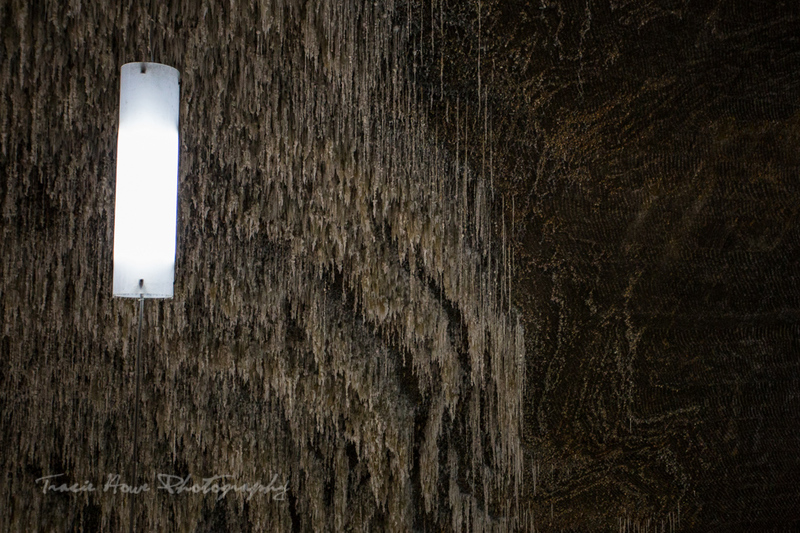 High ISO – Hopefully you have a camera that can be set to a high ISO without losing too much in image quality. If you do, you’ll likely want to set it pretty high if hand holding down there. When you’re moving in a boat, this may be your only option. I went as high as 10,000 ISO in the boat area. Flash – A flash is not ideal, because it won’t light up the entire cavernous space. You’ll probably only have use for it to light up closer subjects unless it’s especially powerful. Taking photos of a boat is also challenging, because the boat and the people in it will be moving. In this case, I recommend choosing a subject that isn’t moving very fast. Even still, you can’t use a very low shutter speed (try to keep it above 1/30 of a sec), so to compensate you will need a high ISO as I mentioned above. A tripod is still a good idea in this case, because that gives the camera stabilization too. There is one spot that gives you a sort of bird’s eye view of the lake and island below. This is a fantastic shot, but be prepared to get creative because the view is somewhat restricted by a barrier. It may be helpful to have a taller tripod to get above the barrier. Protect your camera gear! 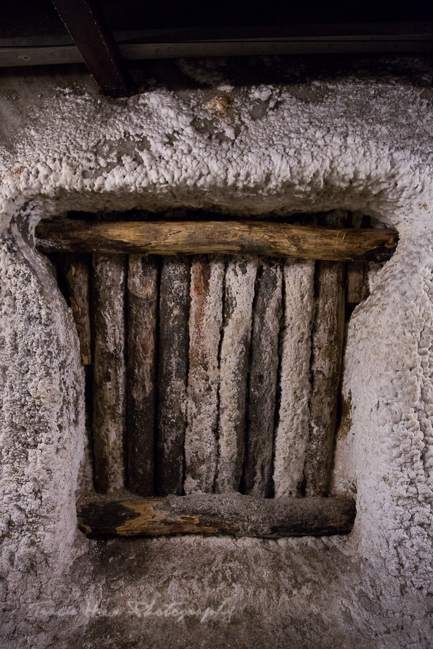 After some time in the mine, you may notice tiny particles of salt building up on your gear. Just keep wiping it off as you notice, but be careful not to scratch your lens. I suggest keeping a lens cap on when you’re not using your camera. As with most attractions, getting there early and avoiding the weekends is always a good idea. 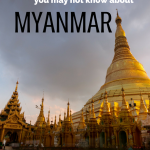 It’s still one of those under-the-radar destinations for many travelers, but that is changing quickly. Get there soon if you can! Look for the Rudolph Mine if your main goal is the amusement park and the Terezia Mine if you want the boats. Taking a photo of a map (if you’re not given a paper version) will help you identify the different mines. If you do find yourself at the other entrance, be sure to eat a cheap Snitzel available there. I have been craving one like it ever since! If you’re able to take the stairs, I recommend skipping the line for the tiny, slow elevator. It’s chilly down there, but you might work up a sweat playing ping-pong or if you struggle at rowing boats like I do. Layers are a good option so you can peel them off as you warm up. June Song - wow! It is amazing! 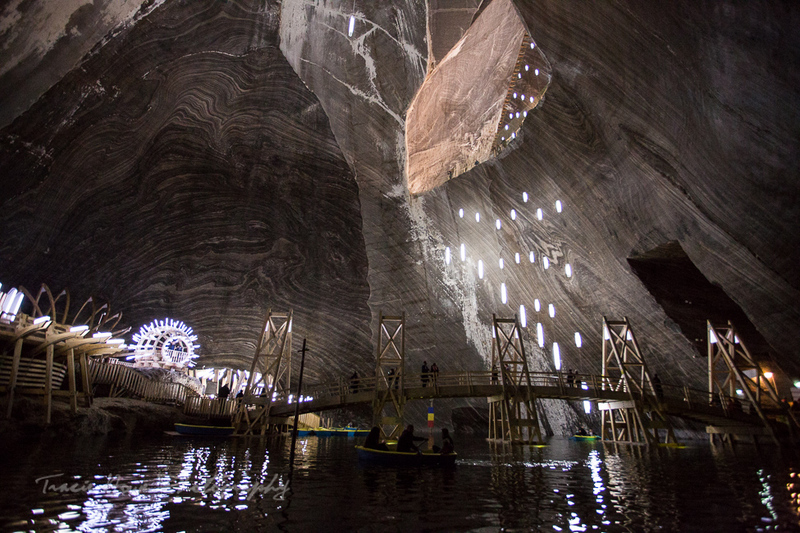 I have never heard of the underground amusement park before! I am really looking forward to going there to spend my weekend.